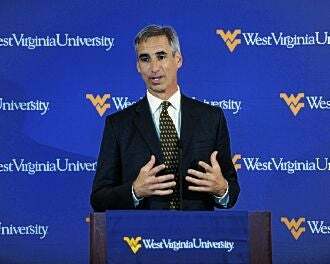 Oliver Luck On West Virginia Leaving The Big East: "Why Is Divorce So Expensive? Because It’s Worth It." Oliver Luck joined 790 The Zone in Atlanta with Mayhem in the A.M. to discuss if the situation is cause for congratulations, the long road trips for the team, a possible situation where Alabama coach Nick Saban lobbied for West Virginia to go to the SEC, what he learned about recruiting through his son Andrew's recruiting process and the situation leading up to the NFL Draft. "Well, it's the old adage: Why is divorce so expensive? Because it's worth it. No, I appreciate the congratulations. We're delighted to be a member of the Big 12. It gives us the financial security and the long-term stability that every athletic director wants for his or her school. So we'll accept the congratulations." "They will be, but considering the alternative, quite honestly, if we remained where we were, we would've been more than likely in a western division. As you guys know, what the Big East has done, adding San Diego State and Boise and Houston and SMU, Memphis. We would be travelling even further. So I think you almost have to almost not compare to what was the case, but what the case was going to be." "I did not talk to Nick. I know Nick well. He was a defensive backs coach at West Virginia when I was a student-athlete in the late 70s. … He and I have a good relationship. I got sort of back in touch with him when he was recruiting my son … but I did not talk to Nick about the SEC. If he was lobbying for us, that's great. I appreciate that. … But that's sort of water under the bridge." "As an athletic director, it's sort of important to keep in mind that ultimately your client, if you will, is the student-athlete. It helps to have a sensitivity to what the parents go through, in terms of just travelling to watch their kids play and the money they have to spend to follow their kid. I'm not sure there's any great insight that I experienced watching my son getting recruited and how that may have affected us, but I think it gave me a sensitivity to what parents go through." "That's part of the process and there's nothing any player can do other than preparing for the draft as best as you can and getting in shape for the combine. All these guys got plenty of game film and I believe that's what scouts ultimately look at because it's one thing to throw or go through drills at a combine or throw 7-on-7 drills, but it's another thing when you're playing. … As we all know, there's no perfect player. There's no perfect human being, there's no perfect radio host, no perfect AD. We're all human, we all have our flaws, and it's entirely appropriate, I suppose, that the scouts pick at every player to determine what that players flaws are." • Rashad Evans is no longer friends with Jon Jones. • Ken Whisenhunt is happy with Kevin Kolb at QB. • Chase Budinger has been waiting for this dunk contest a long time.